Santa is coming to town and the sleigh is piled high with gifts. 3 rigid painting cardboard with canvas structure finish. Picture in the centre measures 40 x 50 cm, pictures on both sides measure 20 x 50 cm each. Precise pre-printed contours with well legible numbers. Water-based acrylic paints. Ready-to-paint pre-mixed colours. Brush with fine tip. Control template and detailed instructions for successful results. 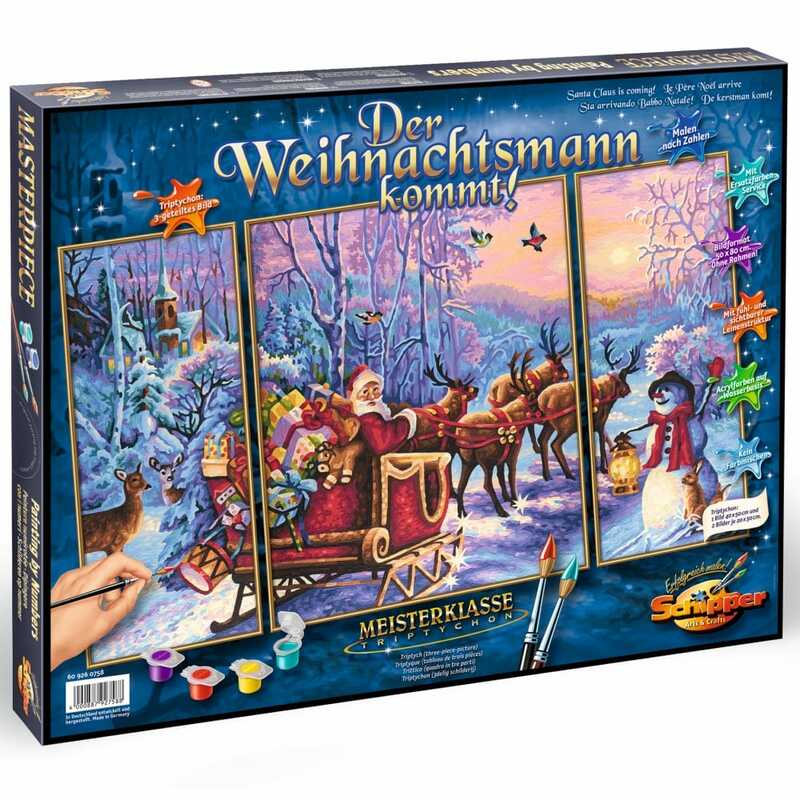 Showing 3 Schipper Premium Paint by Numbers Santa Claus is Coming **^ reviews. Average rating of Excellent. Would you like to write a review? This painting has wonderful bright colours and detail, I have all the other Christmas ones and this finishes the set perfectly. Very good value for money and brilliant customer service. This picture is beautiful, the colours and detail are great. The customer service that I had was amazing , they could not do enough for me. I have been ordering off them for a few years and have never had any problems. I will be going to continue with them for years to come. Having done all the Christmas paintings by Schipper and many other of there painting by numbers these products just get better.